Are you still thinking of your brand as a “brick-and-mortar store with an online shop”? Or maybe “an online retailer with some physical locations”? Most consumers now interact with brands both online and offline — 50 percent said they planned to during last holiday season. As offline and online channels intertwine, your customers are getting used to seeing your brand as a single entity regardless of where they engage with it. They are expecting the same product and service quality whether they're talking to one of your shop assistants or tapping on their smartphones. At the same time, this trend towards the digitalization of commerce has brought down all barriers to engaging brands. In this environment, it's easier than ever for customers to switch between retailers. However, our research shows that over a third of customers buy from a brand based on loyalty, even if they can get better prices elsewhere. Referral and rewards programs are a powerful way to encourage customers to stick around for longer, spend more, and even recommend your products to their friends. Let's explore some of the best tactics for using referral programs in retail and how some brands take advantage of them. Over a third of customers buy from a brand based on loyalty. Providing a seamless experience is one of the prime success factors for any referral program. Since most customers are engaging brands both online and in brick-and-mortar shops, they expect to be able to use their coupons just as easily offline as online. Ulta Beauty's referral program brings channels together. The brand offers cosmetics and beauty products online and at over 900 physical stores. Ulta Beauty understands that customers want to experiment in-store, so it allows them to use referral rewards both in physical locations and online. This helps convert new customers while also encouraging long-term loyalty. Referrals have proven to work very well for Ulta Beauty. Since the brand launched its program in 2015, over 100,000 people have shared referral rewards, driving over 30,000 new registrants to the loyalty program. At the same time, delivering a seamless omnichannel shopping experience to customers is a top priority for the brand, as 70% of referrals rewards are claimed in-store. The following example comes from Ulta Beauty's app, which includes a section where users can claim coupons for special offers. These coupons can be printed, presented in-store on the phone, or entered as a code on the website during checkout. Extole's Site-to-Store feature makes it easy to drive foot traffic to a brick-and-mortar store and redeem this offer at the counter by just scanning the barcode. Online, mobile, and innovative brick-and-mortar concepts have pushed catalog mailings and sales down in the last decade, but the mail order industry is still a giant at $129 billion in annual revenue. Brands that have traditionally operated in that space have been looking for ways to use referral programs and expand into brick-and-mortar and digital channels as a way to keep their market share. One such example comes from children's apparel producer Hanna Andersson. The company was founded in the 1980's, initially only making sales through a catalog. Today, mail orders are still an important channel for the brand, although customers can also make orders online or by visiting one of the physical stores of the brand. Hanna Andersson runs a referral program that exists beyond the website. The brand promotes its coupons in the company's catalog, on Facebook and Twitter, and through email and allows customers to use coupon codes from all these sources for purchases online. By maximizing the number of touchpoints, the brand casts a wide net that can capture a majority of its potential demographic and allow their customers to engage with the brand from anywhere. The results speak for themselves — Hanna Andersson converts customers with its referral program at 3x-4x the rate of other channels. With traditional programs, customers refer friends in order to get coupons or discounts that have to be redeemed within one sale. Some brands choose to adopt a different process, by gamifying their rewards program to make them more appealing to customers. The aim with these programs is to motivate customers to stay engaged with the program and put more effort in earning rewards and recruit more new customers for the brands. 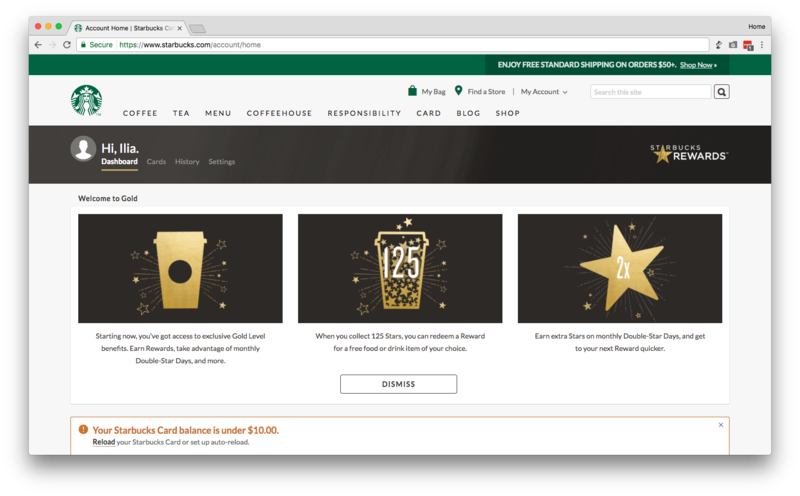 Starbucks Rewards program is an example of this gamification approach. Customers are issued free Starbucks cards which can be pre-loaded with a balance to spend at Starbucks locations. For each dollar spent on beverages or food, customers collect stars. When customers collect 300 stars, they earn Gold status, which entitles them to a personalized gold card and allows them to start earning a free drink or food item for each 125 stars collected. Gamification makes Starbucks' program more attractive since customers always have the opportunity to take advantage of it. This program encourages overall brand loyalty rather than repeat purchases of the same product, the way “10th drink on us” programs do. When a friend or a co-worker recommends a product, we are more likely to consider buying it not just because we already trust those people, but because we know they face the same problems as us. So when they say they've found a way to deal with those challenges, we're naturally more inclined to see if they can help us overcome them as well. Combining personal referrals with a recommendation for a specific product is a powerful way to increase the conversion rate of those programs. Shoes for Crews, a company that retails slip resistant shoes, has used this tactic successfully. They use referrals to target employees — rather than employers — directly. Referrals play an important role — once customers see that their shoes are a secure way to avoid getting hurt, they are very likely to recommend them to co-workers and friends who work in similar fields, thus helping Shoes for Crews expand into new market segments. Because of the large amount of products offered by the brand, and the fact that so much depends on the positive experience people have with a particular model, Shoes for Crews encourages people to share a specific product by placing a call to action on each product page. 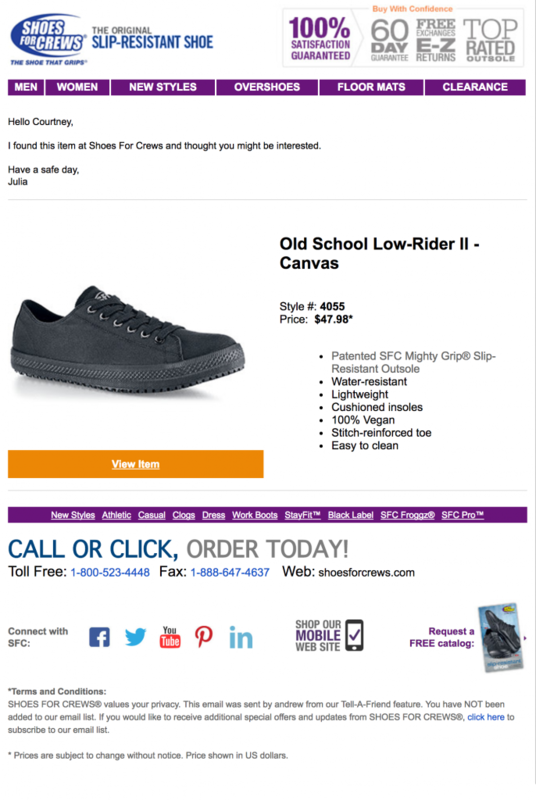 When customers send a recommendation, their peers receive a personalized email, which includes a message from their friend, as well as information about the product that has been referred to them. As physical and digital retail channels converge, it becomes harder than ever to capture and hold a share of the market. Customers are increasingly empowered by technology to find the products they need at better prices. But these same developments are making it possible for brands to capture a loyal following. Instead of defining themselves as online or “brick-and-mortar” retailers, the most innovative brands, both big and small, use referrals programs to build relationships and turn their customers into advocates.